Painting and remodelling services throughout Delaware County PA, Chester County PA, New Castle County Delaware. Morning calls are returned by 1 PM. Afternoon calls are returned by 6 PM. We will be on time for the estimate and for the project start. We don't get paid until the punch list is finished to your satisfaction. Residential and commercial painting and paperhanging experts. The Kapski Family are longtime residents of Media, PA. with deep roots in the community. Active membership in Painters and Decorating Contractors of America, PDCA, since 1967. Take a look at our satisfied customer references and see what people in the area are saying about us. Our list of Satisfied Customers is growing every week! 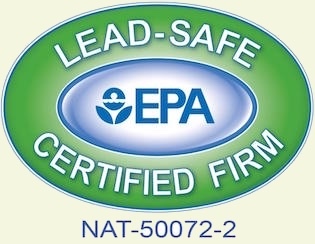 Kapski Painting is proud to have been certified by the United States Environmental Protection Agency "to conduct lead-based paint renovation, repair, and painting activities pursuant to 40 CFR Part 745.89". View our certification here. Painting and wallcovering warranty labor and material for a period of (2) years. 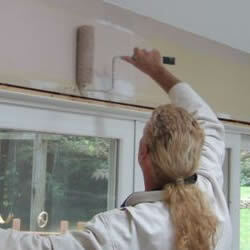 If paint failure apears, we will supply labor and material to correct the condition without cost. This warranty is in lieu of all other warranties, expressed or implied. Our responsibility is limited to correcting the condition as indicated above. The warranty excludes, and, in no event shall Kapski Painting be responsible for consequential or incidental damages cause by accident or abuse, temperature changes,settlement or moisture, ie. cracks caused by expansion and/or contraction, or acculation of dirt or other particles causing discoloration or change in the appearance of materials. Cracks will be properly prepared as indicated at the time of the job, but will not be covered under this warranty. "When it comes to your home's exterior, color is currency. With millions of homes across the country currently on the market, smart homeowners are differentiating their houses and wowing potential buyers with color." - Delaware County Daily Times, March 30, 2008. Protect your investment and maximize your home's resale value with a fresh, new look. Call 610.565.8571 now for a free, in-home estimate. Need advice on which colors to choose? No problem. We have all the latest color swatches and fan decks for you to choose from. Our representative will be happy to work with you to pick just the right color!